My name is Harrison Pontonio or as many of you already know me as, Harry. 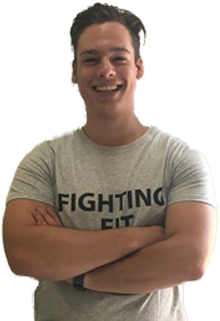 I am a newly qualified and highly dedicated, passionate and a driven trainer, a lover of all things active ranging from being an avid Hiker, Bouldering and newly being a triathlete. I am someone who places high importance on correct technique and functional exercise making sure everyone is able to achieve their best selves. I am able to assist with weight loss, hypertrophy (muscle growth), strength and conditioning training as well as general level pre/rehab. I have personal experience and solid knowledge of the importance and need for proper form, good technique and strengthening our bodies to keep up with us in our otherwise busy lives. Having undergone numerous hours of rehabilitation for torn MCL in right knee, two shoulder reconstructions and a multitude of ankle injuries (all this due to my genetic Hypermobility) I have personal experience and solid knowledge of how to work with these injuries as well as how to help solve and prevent them at a general level.